"The teaching without reasoning is unavailing but the reasoning without teaching is dangerous"
Elliott Wave International's newly designed tutorial is the most comprehensive introduction to the Elliott Wave Principle available in cyberspace. All ten lessons have been adapted from Prechter and Frost’s Wall Street bestseller, Elliott Wave Principle - Key to Market Behavior. Elliott Wave International's just lined (July 9, 2004) up three seminars on discovering opportunities in the commodities markets with Jeffrey Kennedy. Jeffrey is the editor of Futures Junctures and has been an analyst for EWI since 1993. He provides daily and intraday analysis on more than 100 different financial markets for individual and institutional investors worldwide. This event is being sponsored by Fox Investments. Over the next 4 months, Jeffrey will be holding one-day seminars in three different cities. 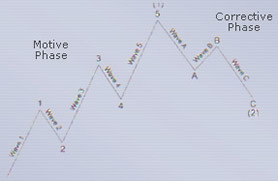 The Wave Principle is your key to understanding the markets, and The Elliott Wave Educational Video Series is your key to understanding the Wave Principle. The 10-tape series, recorded over 15 years ago, continues to be among our most popular products. The new DVD format truly transforms the video series into the ultimate Wave Principle reference. Best Value: Buy the 10-disc series for $1199. Or, if you already own discs 1-4, complete your set with the last 6 discs for $749. Save almost 15% when you buy the package instead of each disc individually. To ensure you’re satisfied with your Elliott Wave DVD(s), we offer this guarantee: When you receive your DVD(s), you may unwrap and view any one DVD. If you decide the DVD(s) are not for you, simply return them within 30 days. We’ll give you a cheerful, 100% refund of the purchase price. If you purchase more than one DVD, please note that we will only accept one opened disc. The other discs must be returned in their original wrapping. Order above online for convenience, or call our customer service representatives at 800-336-1618 or 770-536-0309 (from outside the U.S.). When calling, please mention code AFF TD. This is EWI most-expensive, specialized market forecasting services were previously reserved mostly for professional traders. But now EWI have unpackaged them, making them far more affordable for private investors and traders. EWI's Specialty Services give you forecasts you need – forecasts you'll use. And for the depth of coverage you get, they're bargain-priced.